Before we get started listing the pros and cons, we should explain what exactly VoIP is. Voice over Internet Protocol uses your organization’s existing Internet connection to make and receive phone calls. Besides phone calls, it also gives organizational access to other features like voicemail, call waiting, call forwarding, and instant messaging. 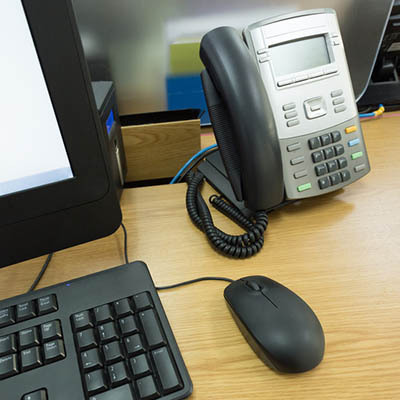 If your business still uses landlines from a telephone service provider, VoIP can go a long way toward reducing your monthly costs, while providing a system that is reliable enough for business. The biggest benefit that a VoIP system can provide is the cost savings. Some VoIP systems are less feature-rich than others, but if you get one that has all the bells and whistles, you can make and receive calls from anywhere using multiple phones. Another potential benefit is that often times a VoIP system is at the center of a unified communications system. With the right solution, you can integrate conferencing, instant messaging, email, and your VoIP business phone system into a superior support and communications platform. Some VoIP platforms also provide users with video chat and file sharing, making it simpler than ever to collaborate. As stated above an additional benefit of a VoIP telephony system is that it can be used from multiple phones. Not only can you use a VoIP solution from a headphone and mic hooked into your computer, you can also get phone handsets that hook up to a computer providing a more traditional experience to callers. Many VoIP solutions have dedicated applications that can be downloaded from the various app stores and run on a mobile device. A quick setup can provide you with a mobile work phone. It may be hard to consider any cons to VoIP when you look at the cost difference between the two, but there are some troubling aspects of your average VoIP system. One is security. Some organizations simply don’t trust other organizations with their data. If yours is one of these, you would have to buy the PBX server that would run your phone system. These PBX servers can be very expensive to buy and cost a lot more to properly set up. With cloud-hosted platforms, however, all of this cost is mitigated. Another qualification some VoIP users have struggled with is call clarity. The way VoIP works, Turing voice files into data packets and sending them over the Internet can produce some lackluster audio results. Some produce choppy communications, while others will lag. This is largely because when data packets are sent sometimes they aren’t sent (or received) in the right order. This is a normal problem in data transmission, but when you are listening to a choppy voice on the other end of the phone, it doesn’t matter what the reasons are. Additionally, if your organization doesn’t have the proper bandwidth to effectively run a VoIP solution, you may have problems with your sound. If this is the case, the business looking to implement the VoIP product will likely have to upgrade their organizational bandwidth in order to have a reliable voice over IP system. Lastly, emergency services can be elusive with a VoIP solution. Since the location of the caller can’t always be determined with VoIP, a call to 911 will sometimes give you a dispatcher multiple jurisdictions away. Implementing a VoIP system can make loads of sense for any growing or established small and medium-sized business. Are you thinking about it switching? If so, contact the expert consultants at Strata Information Technology and we can set you up with several VoIP options that you can then customize to meet the needs of your business. Call us today at 888.678.7282 for more information.